We spend the cold months shut in our home, fire blazing, puffy coat layering, soup eating. It always feels like a miracle when we can leave the sliding glass door open all day, the scent of cottonwood a welcome guest in our living room. Our home gives us plenty but sometimes we do feel packed in our small living space. When the sun is high and the air warm, we enjoy the ease of eating, sitting, living in our outside spaces. And I just love putzing (as my grandma and mom say) around, arranging and readying the additional “rooms” we have for five months of the year. Just as the chives emerge and the bees stir, I can be found digging around our garden shed for pots and chairs. Today I am sharing a little peek at our cheery deck! Come on. Have a seat. Wait, first let me show you what our deck and living room look like right this minute. We are in the middle of laying tile in our kitchen – the exciting next phase of our ongoing project. I want interesting and beautiful things; I don’t want anything I don’t want to look at. Yes: this includes kid toys and functional objects like trash cans and brooms. I use what I already have kicking around and only buy what I really want. Most things in our home are thifted or found. And the things we buy? We save up and get the thing that will last, the thing we love, the thing that adds joy to our ritual. I don’t want disposable things or cheap, cute things that will be in next year’s giveaway pile. I’d much rather wait. And usually, when I wait I find it or something even better. I am not a spontaneous purchaser. Unless we are talking about grocery shopping and then I am a different, impromptu-purchasing beast. We live raucously in our space. We don’t always take our shoes off and our small kids jump and cartwheel through their days, usually with several pals in tow. I want the space we create to share with our loved ones to be joyful, comfortable, artful, restorative and not too precious. The things that I bought new on our deck: plants, metal chairs & square table (Costco, 8 years ago), oil cloth for the tables, outdoor mat and the glass hummingbird feeder. Everything else was free or thrifted for less than $5. People say you have the best luck thrifting! I don’t. I’m just patient and I enjoy the process of looking – I SO did not get all this stuff in one thrift/alley hunt outing. And the things I made didn’t happen in one night either. :: The oilcloth booster seats were made from a pattern in One-Yard Wonders years ago and they are still going strong. And here is my tutorial for the DIY patio chair cushions I made last summer. Both are super easy to make. :: I cut the oilcloth to size and to keep it from flying up with the wind, I attached some old curtain clips around the edge of the table. And! I found a use for all those mateless earrings I’ve been holding onto. :: I always grab sturdy, old metal things when I find them, even when I don’t know what I’ll use them for. Andy loves this habit of mine! Like the chain that holds the hummingbird feeder (garage sale) and the ring that holds the hanging geranium (found buried in garden) and the horseshoes that hold the tablecloth down (free pile). I chose a red geranium for the hanging basket next to the hummingbird feeder because hummingbirds like red and I don’t want to dye the sugar water solution. It works! We are getting lots of hummingbirds. :: I get asked a lot about this outdoor mat. It is entirely effortless regarding upkeep etc. It is woven plastic! There isn’t a backer or anything that could absorb stains or water. The first time I saw a mat like this was at my mother-in-law’s house and she had picked it up in Mexico (I think?). Anyway, they are so lovely to sit on and water just rolls right through. :: For container plants I like to do herbs and succulents and a few flowers. The herbs we use all season, the succulents become houseplants or gifts and the flowers just because they are jolly. For the containers: freebies, thrifted. I am always looking for plant vessels. Herbs I purchased: tarragon, rosemary, lemongrass, cilantro, sage. :: My kids love to play kitchen and restaurant. They spend hours writing up menus, taking orders, mixing and baking. We used to have a little red kitchen but they outgrew it and, since then, their concoctions have been concocted on our table. I saw a $.50 mint bowl at Goodwill a few weeks ago and it called to me. The bowl whispered I want to be a sink. Make a kitchen using the existing bench on your deck! (that we can’t sit on because it is falling apart). A cut hole, a few nails and an assortment of second-hand kitchen things and we have a kitchen play space. I put it together when the kids were at a friends house. When they came home Ruby said it was the best gift she’d ever received. Yes. I love it because they love it and also because this bench was previously a dead, useless space. Now, it is full of life and imagination. I am a meanie and won’t let them use real food for play so the kids mostly bake with sawdust and used coffee grounds. Occasional bits of pinecone, dirt, watermelon rind etc. :: This grapevine is quite old and giant. I pruned the heck out of it this spring and cannot believe how much new growth is bursting out as a result. 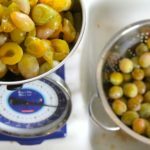 Do you have good grape canning recipes? I think we are about to be into pounds and pounds of grapes. :: Our table centerpiece is an old pot in a serving dish atop a thrifted doily. We surrounded the pot with found colored glass, much of it seaglass – a thoughtful gift from my friend Tammi. Antlers are from my uncle. :: And, the best part of our deck is the life that happens there. Lots of food to be shared around this table, forts to be constructed, naps to be enjoyed, birds to be watched. With handstand and roundoff breaks, of course. I LOVE the outdoor play kitchen, what a fantastic idea! The oil cloth tablecloth is a wonderful idea too. 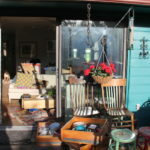 I have been resistant to thrifting because I have an intense fear of clutter. However, my husband loves it but has taught me it’s really all about looking, you don’t buy unless you love. Last fall we found the exact 1950s kitchen table and chairs set we were looking for at a flea market. It’s being stored in my parent’s basement until we have a place big enough but I’m so glad we snapped it up when we did! Thanks for the tour! This is really cute. I like it a lot! Your space is quite lovely! Life happening in any space is really the best part – otherwise, there’s no need of the space. God bless the frugal, creative mama! What a beautiful, colorful, cheerful and fun family space. Peeks into your life are always a treat. And hooray grapes! I had sticker shock when I picked some up at the grocery store today. The checker rang them up and I asked her to take them off my tab, like whoa $11. Let us know what sort of concoction you figure out for them, as you always do! Your hummingbird solution is genius. I also don’t like to dye the sugar water and gave up a couple of years ago after a few failed attempts with red plastic-bottomed feeders. I can’t wait to borrow this idea. Beautiful space, thank you for sharing! We have been in our home for five years. Each spring I add something new to the yard. This year was blueberries. Next year a grape arbor. I love to create and develope, sometime stuff doesn’t work out or I change my mind the next year, but isn’t it cool how your home can change and evolve with you? So inviting and fun and warm! Definitely wishing I had your gift of thrifting! I honestly can’t remember what is in it! I do a lot of curry variations and have lately enjoyed making different curry spices. This one is with tofu, peas and squash. I love the play kitchen- my girls are always concocting mud pies and the like, adorned with flowers and other yard randomness. I have a glorious grape pie recipe… If you’ve never had a grape pie it is AWESOME. Yes please! Send me the recipe! 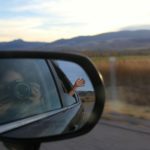 Every time I read your blog I think- she is awesome. I have two small boys and am so inspired by how fiercely you love those girls and the life you have created for them. Thank you for sharing all these bits with us! Oilcloth for cushions!! Genius! I’m saving that in my reserves for the next time my cushions need recovered. You have a lovely space! Absolutely love your writing and everything you share. My family is in the midst of a lengthy transition between homes and careers, etc. and I think of the way your family makes choices and it helps me to focus on what we truly want in our lives instead of getting caught up in just wanting this trying time to be over and done. So thank you for that! The grape pie recipe I use is from a cookbook from my hometown. It’s written down on this blog: http://musingsofavintagejunkie.blogspot.com/2013/10/the-fruits-of-my-adventure-in-wine.html except that it is meant for 1 pie (not two, like the blogger writes) and it is written to have a normal dough top as well. It is absolutely delicious, but MUST be eaten with vanilla ice cream. Without question. I always had so many grapes that I would simply can the filling, leaving a bit of extra headspace due to the flour in the mix. My sister used the same recipe and would make the pies fully in advance and freeze them. They do freeze quite well. I’d love to see the fruits of your labor in the fall!